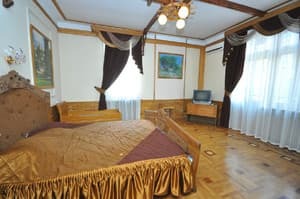 A guest house "Mednyj Vsadnik" comprises all the necessary for comfortable rest. On the territory of the guest house: a guarded parking, close swimming-pool with the heating water, colourful fountain, solarium equipped with chaise lounges and tables for meals, kolyba (a wooden felling with a shed fof 12 persons) and a stove-barbeque, a sauna with a pool a tennis table, gym, a winter garden with subtropical plants and parterre, summer garden with the panoramic view of the sea and mountains, a cafe, a playground, organization of excursions in the Crimea, transport services (comfortable microbus), wireless Internet, sunmer cinema are at your service. There is a comfortable slope aerial cableway to the sea to the close beach of the guest house "Donbas". The way to Yalta: by a fixed route taxi; by trolleybus (3-4 stops); by taxi (a quick come in 5 minutes); on foot through the park zone. The guest house comprises 2 detachd villas: "Mednyj Vsadnik" and "Amazonka". The villa "Mednyj Vsadnik" consists of 4 floors. The ground floor: biliards, the room of the administrator. The first floor: a three-room apartment (2 bedrooms, beds with orthopaedic mattrasses, a spacious loving-room with a fireplace, TVset, airconditioner, a bathroom, a kitchen, a fridge, a balcony. The general square 140 м2, separate entrance.The third floor: a winter garden full of subtropical plants, a sport corner, a gym, table tennis, library, summer garden with comfortable tables and armchairs with the the panoramic view of Yalta, mountains and sea. In the interior the valuable kinds of wood were used. A experienced chef-cook will provide you with delicious and fresh meals twenty-four-hour. Cold drinks, juice, ice cream are in a wide choice. The delivery into the room is posible. Meals in cafes is not an obligatory condition of staying at the guest house. In the guest house children's entertainings are provided - a sandpit, swimming-pool for children, a swing, a fountain with colour music. 30m from the guest house in the Massandra park there is a public playground with characters from fairy-tales. In every de lux room, in the hall there is a folding bed for the smallest. Children's beds can be placed. 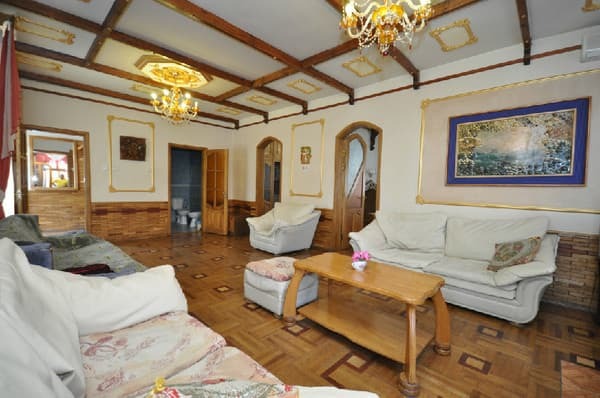 Meals, billiards, sauna, and excursions are not included into the price of the residence and are payed separately. 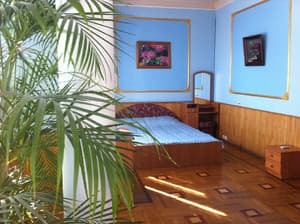 The most exciting rest in the Crimea you will get at our guest house "Mednyj Vsadnik". Description of the room: The total area of ​​the room is 60 sq. M. The room has: a hall, a bedroom (a bed with an orthopedic mattress) and a bathroom. The room can accommodate up to 6 people (4 main beds, 2 extra beds). 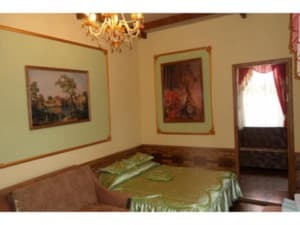 Description of the room: Area of ​​the room is 35 sq.m. The room has: 3 double beds, 1 double sofa bed and 1 single bed. Description of the room: 4 main places and 4 additional. The payment does not change from the quantity of the living people. In every de lux room, in the hall there is a folding bed for the smallest. Children's beds can be placed. 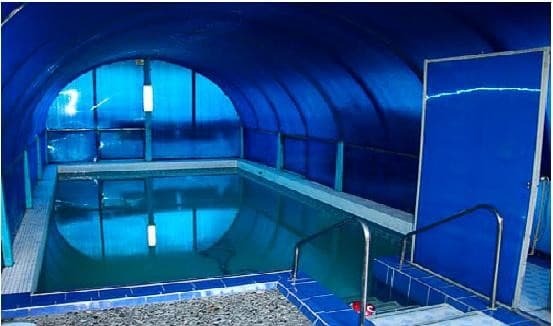 The guest house is situated in the eastern suburb of the urban-village Massandra, on the outskirts of the largest Massandra park in the Crimea. The Massandra park was laid in the beginning of the XIX century and occupies 42 hectares. 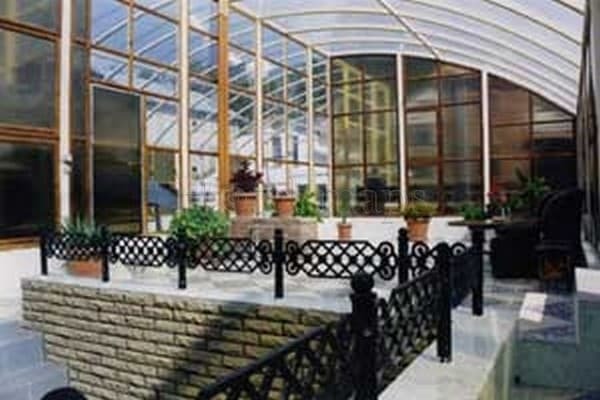 There is a suitable entrance to the guest house from the main highway "Simferopol' - Yalta". The guidelines of the location of the guest house "Mednyj Vsadnik" are the guest house "Donbas" (150 m) and the hotel-intourist "Yalta" (500 m). 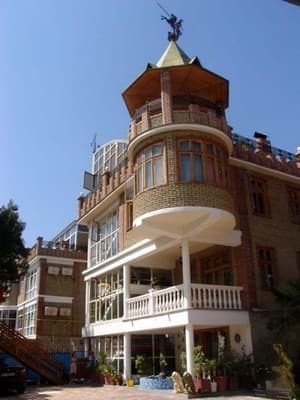 The guest house is situated in the eastern suburb of Yalta in the urban-village Massandra, on the outskirts of the largest Massandra park in the Crimea. The Massandra park was laid in the beginning of the XIX century and occupies 42 hectares. There is a suitable entrance to the guest house from the main highway "Simferopol' - Yalta". The guidelines of the location of the guest house "Mednyj Vsadnik" are the guest house "Donbas" (150 m) and the hotel-intourist "Yalta" (500 m).